Transparency Market Research (TMR) has published a new report titled, “Hospital Asset Management Market - Global Industry Analysis, Size, Share, Growth, Trends, and Forecast, 2018–2026”. 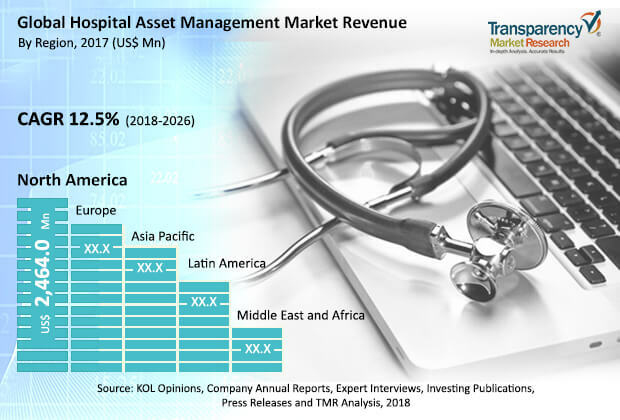 According to the report, the global hospital asset management market was valued at US$ 5.0 Bn in 2017 and is projected to expand at a CAGR of 12.0% from 2018 to 2026. Improvement and optimization of workflow, safety, and productivity; reduction in inventory, and higher return on investment are anticipated to boost the growth of the global hospital asset management market during the forecast period. Developed regions having better health care IT infrastructure are likely to account for major market share in terms of revenue in the next few years. Major market players are involved in continuous technological advancements through focused research and development activities, which is resulting in development of cost-effective solutions. Some of the prominent players are likely to expand their geographical presence through partnership agreements in the high growth potential developing markets during the forecast period. The report offers detailed segmentation of the global hospital asset management market based on product and application. In terms of product, the real-time location systems (RTLS) segment is poised to account for major share of the global market in terms of revenue between 2018 and 2026. Factors attributed to high market share of the segment include strong brand presence of key players offering proprietary product technologies and technical advantages such as the ability of outdoor asset tracking, information encryption service, and tamper evident sensor, among others. In terms of application, the global hospital asset management market has been categorized into patient management, staff management, instrument management, and supply chain management. The instrument management segment is anticipated to expand at a moderate growth rate during the forecast period. Intense competition between established companies as well as new entrants is likely to result in affordable asset tags during the forecast period. This in turn is expected to increase installation rate of hospital asset management solutions for instrument management. Increased government focus on reducing workload of nurses and doctors and rise in focus of hospital administration to ensure patient as well as staff safety fuel the growth of the hospital asset management market in developing regions. In July 2016, the King Hamad University Hospital in Bahrain installed nearly 1,200 asset tags to locate wheelchairs, ultrasound equipment, and IV pumps to improve operational efficiency and response time. Increase in installation of hospital asset management solutions for instrument management is spurring the growth of the global hospital asset management market. The report also provides profiles of prominent players operating in the global hospital asset management market. These include Ascom, Awarepoint Corporation, CenTrak, Ekahau, GE Healthcare, Honeywell International, Inc., Impinj, Inc., Sonitor Technologies, STANLEY Healthcare, and ZIH Corp. The global hospital asset management market is significantly fragmented and tier I companies accounted for nearly 25.0% market share in 2017. Strategic partnerships for research and product development has been a characteristic trend among the major players in the global hospital asset management market.